Legend has it that in 1574 there was a glassmaker’s assistant in Milan whose nickname was Zaffereno (Saffron). He always mixed a bit of saffron into the colours for the stained glass to make it more vivid. The glassmaker used to joke that he’ll be putting it into risotto next. When the glassmaker’s daughter got married he did just that. 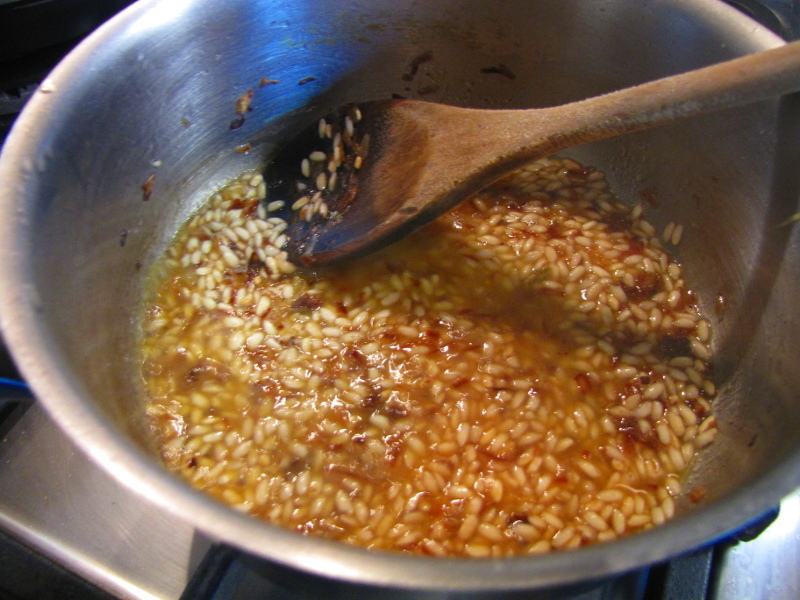 The steaming pots of golden rice was a huge success with the guests and it became a classic Milanese dish. Inspired by a recipe from the Italyum blog. I made this as a starter for 2. 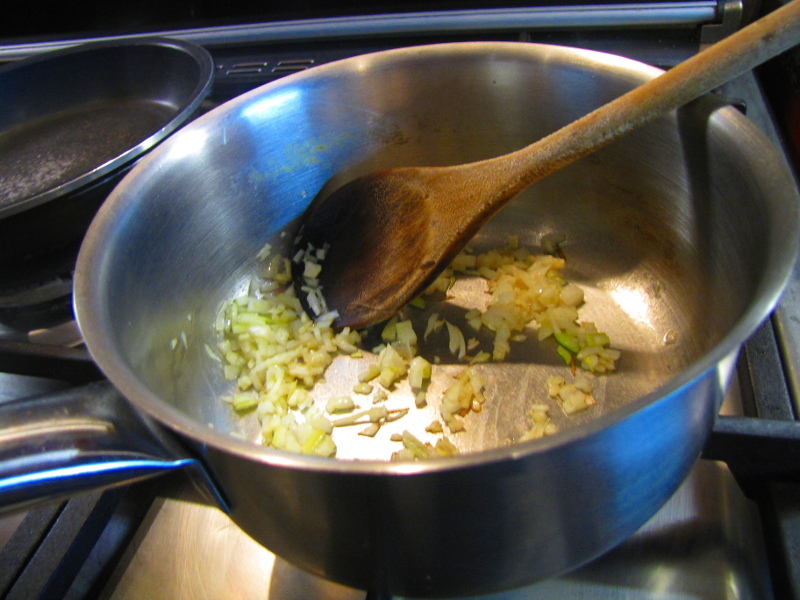 Melt 1 tsp butter in a pan and add the onion. Fry for 2-3 minutes. Add the bone marrow and cook for another 2-3 minutes, breaking up the bone marrow as it cooks. 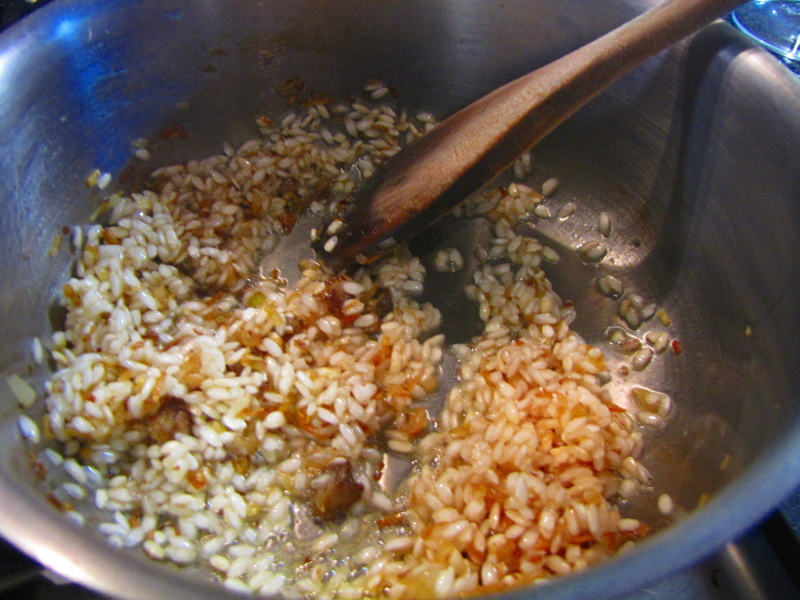 Add the rice and stir so that it is coated in the fat. Keep stirring for 2-3 minutes until it becomes translucent. Then add the white wine and stir until it evaporates. Add the hot stock and turn down the heat to medium/low. Add a little stock and stir until it is absorbed. Continue doing this with the rest of the stock for about 15 minutes. Now you must start tasting the rice every minute. It should be tender on the outside and firm on the inside. If not add more stock and continue cooking. Taste every minute as you do not want to overcook this. Make sure that you have some extra stock on hand for if you end up needing more than 500 ml. Only add a little bit of stock at a time towards the end to ensure that your risotto does not become watery. Add the saffron stock and stir until all the rice turns golden yellow. Continue cooking, adding more stock if required until the rice is perfectly cooked. Take the pan off the heat and add the remaining 1tsp butter. Stir until completely melted. 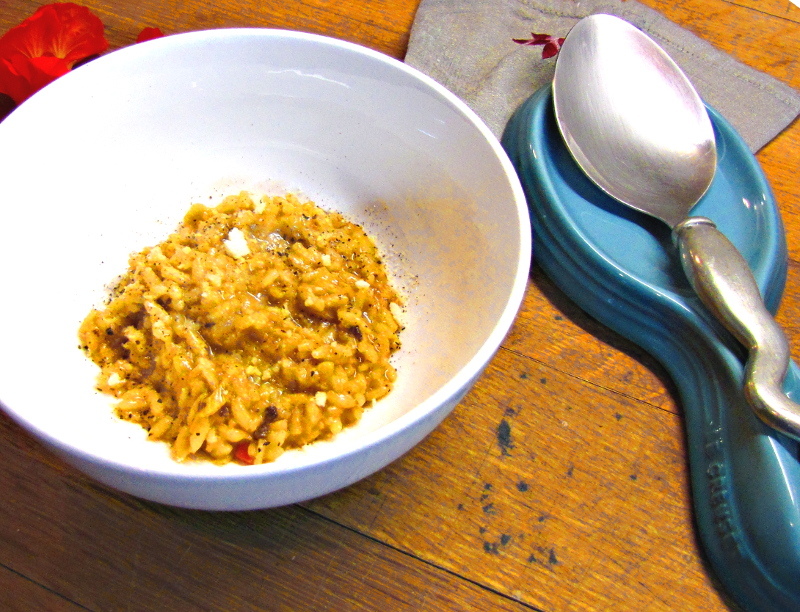 Cover the pan and let the risotto rest for a minute before serving. This was so good ! The bone marrow, butter and cheese makes it an incredibly rich dish but worth every calorie. We had this as a starter for our Italian date night. Our main course was Braciole 3 Ways and we had Coffee Panna cotta for dessert. Dit lyk baie smaaklik. Waar kry mens bone marrow? Dankie Pieter – dit was baie lekker ! Jy behoort “marrow bones” by enige goeie slaghuis te kry. Dis gewoonlik nie op die rak nie so jy moet daarvoor vra. Hoop jy kom reg.